Last August a few friends and I flew out to Split on the Dalmatian coast for a week of sun, sea and drinks. First thing our taxi driver said to us upon arrival was “why are you here? Party season is over!” Fortunately we discovered the Split Tower Pub Crawl, running every night from 9 pm. Read on to discover whether it’s worth your 150 Kuna! 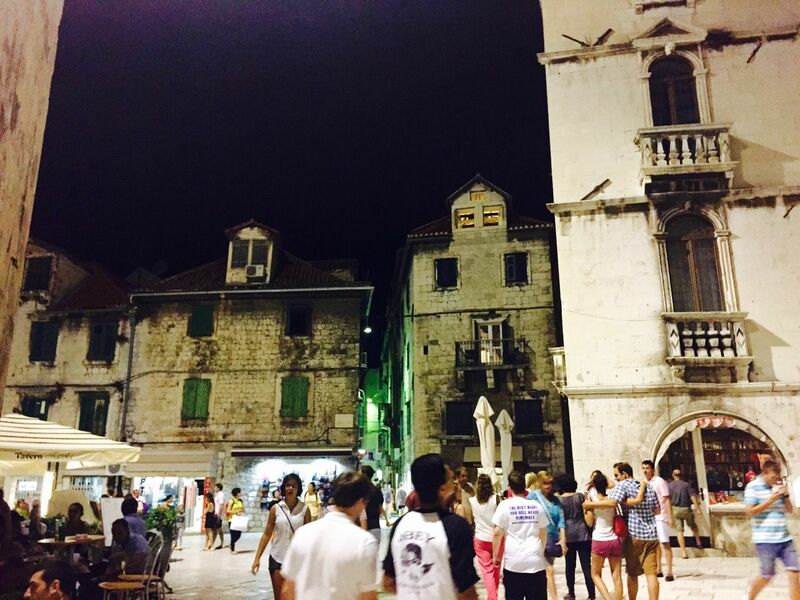 The Tower Pub Crawl starts every evening at 9 pm in the square in front of the bell tower of the Cathedral of Saint Domnius, originally built in AD 305. The pub crawl’s history is nearly as long, as the longest running in Split, and the biggest. 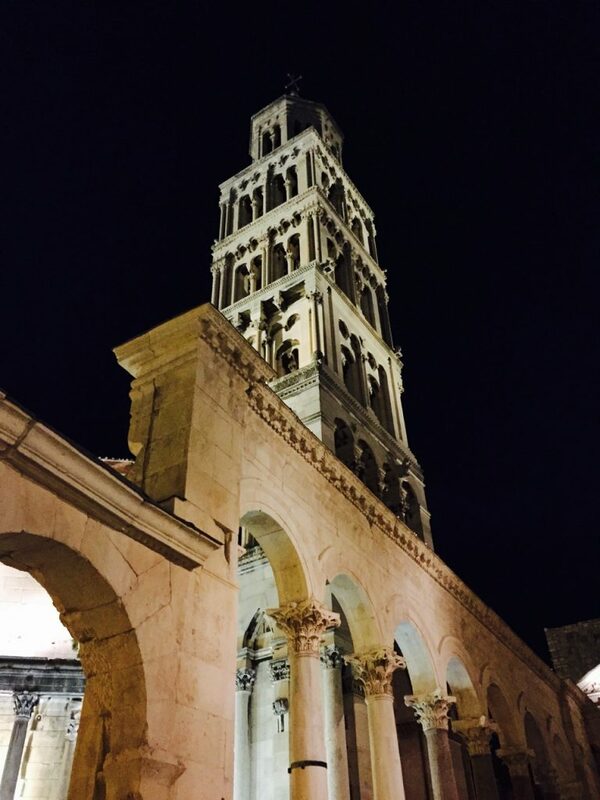 Much like the architecture of Diocletian’s Palace, the pub crawl left a big impression on us, as we ended up going three times during our time in Split, which is both a reflection of it’s quality as it is a sign of mild autism. After spending around half an hour debating the pros and cons of a receding hairline with a pair of French backpackers, our guide, with his signature green umbrella marking the meeting point, took us to the first bar. After picking up our wrist bands, the guide took us around the back of a building to a rusty metal door in the middle of a wall with no windows, which admittedly looked a bit dodgy. After his secret knock, the door was opened by a member of staff wearing a Tower Pub Crawl t-shirt. We filed in, everyone who’d ordered online were given a free t-shirt, everyone else went straight to the bar. Unlike other pub crawls I’d been on, the entire room had been reserved just for the pub crawlers, plus an outdoor area where they’d set up tables for beer pong, flip cup, and other games. It was just like being back at university! As soon as the last person was in, the timer started for the ‘power hour’. Reflective of the laid back Croatian lifestyle, the ‘hour’ actually lasted a whole 90 minutes, giving us extra time to knock back spirits and mixers, beers and ciders that they’d laid on for us – all included in the price! To get us in the party spirit, the hosts were busy organising the aforementioned drinking games outside, which were extremely popular, and led to several rounds of us taking on teams of Germans, Irish and Aussies at the games they’d set up. This was no doubt one of the more full-on bar crawls I’d been on, and a lot of fun! To help soak up the alcohol, massive 18” pizzas were handed out to us – an added bonus! Once our 90 minutes were up, everyone was herded out to the courtyard, where one of the guides got on the mic and began hyping up the crowd with singing and chanting, followed by a bizarre motivational speech, before finally we were all whipped up into a frenzy, and which point they opened the gates and unleashed us upon the city. We were then led down the promenade to a club on the seafront near the harbour, which had a large temporary stage set up out the front with dancers and a DJ booth, as well as a cavernous indoors area. What was weird about this bar was that local families had turned up – with their kids! It was a bit unusual, not least because it was now coming up for midnight – maybe it’s normal here to take your 10 year old clubbing here? 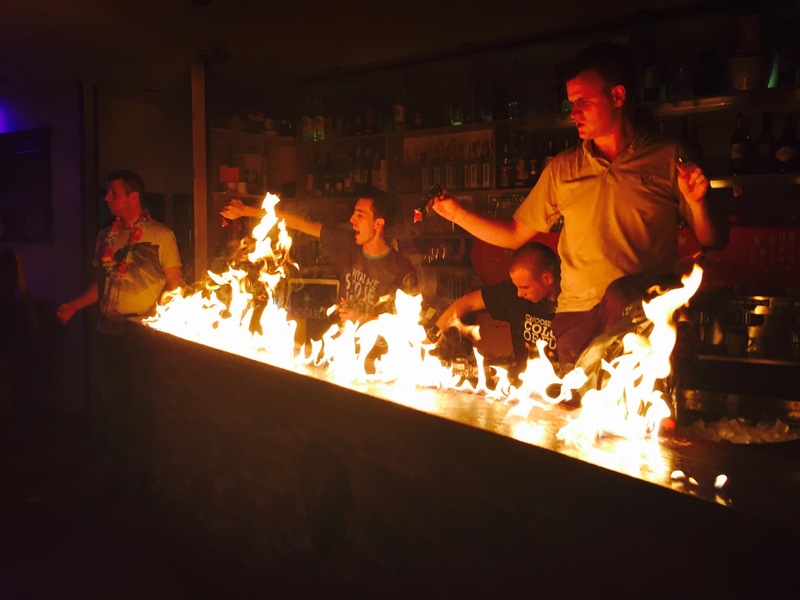 Nevertheless, the party was in full swing, with things (literally) hotting up as the staff set fire to the bar and parts of the floor. Drinks were not quite as cheap here as some other places in Split, but it didn’t really matter considering how much alcohol was available during the power hour! We stayed here for around an hour and a half, when we began getting ready to move on to the final destination on our route. The final stop on the pub crawl was Tropic Club, a short walk from the promenade, next to Bacvice beach. Yes, this pub crawl may seem short as it only had thee stops, however the we were given a lot of time at each location, avoiding any feeling of being rushed. Entry to the club is up a long narrow stair case at the end of the beach. 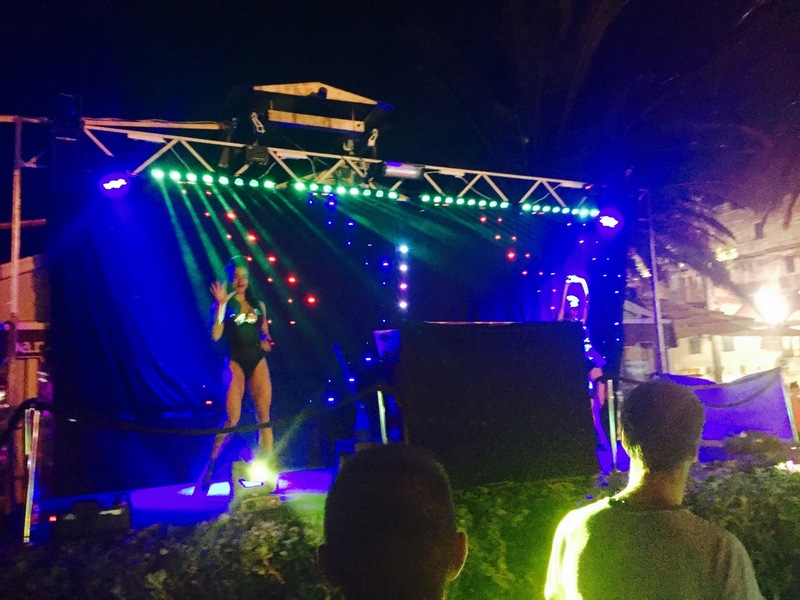 Several other bars and clubs are adjoined to Tropic Club along the sea front, with each bar leading on to the next, giving you the ability to move between them at will for different drinks deals, music and dance floors. There’s no entry fees to any of the bars so you’re free to go to any that you fancy! One of the more inebriated members of our group was actually convinced we were on a huge cruise ship, thanks to the unusual layout and sea view. After our entry shots, we got into the club. Tropic Club itself was rather small, filling up rapidly, it actually became quite cramped – every one was packed in like sardines. Many of the pub crawlers had dispersed, so we ended up exploring some of the other bars. As the club was next to Bacvice beach, we were within swimming distance of a large inflatable assault course moored in the bay, as you’d expect by around 3 AM, many people had swum out to it, though it’s best avoided before then, unless you want to be the awkward third wheel on a couple’s ‘date’. If you do swim out there, make sure you get a friend to look after your clothes on the seafront – a friend of mine had his wallet stolen when he left his trousers hidden in a bush. It also goes without saying, there’s no lifeguard on duty in the early hours, so only swim out if you’re a strong swimmer! The power hour is the real highlight of this pub crawl, thanks to the great organisation of the pub crawl team – the games are a lot of fun provided you’re up for getting involved. It’s also a huge pub crawl attracting a friendly crowd, so a great way to meet fellow travellers. The only real downside is the final club, which is very small. We were packed in extremely tightly each night we went, with literally no room to move, never mind dancing, so it was hard to get around. At least there are lots of other bars in the area to go to instead if it’s not your thing. There is also the Ziggy Star pub crawl in Split if you want to try a different one, however we didn’t go for this – at the time in August 2015 the last few reviews were rather negative, however it is now ranked 4.5/5 – the same as Tower pub crawl – so it may have been going through a rough patch at the time.